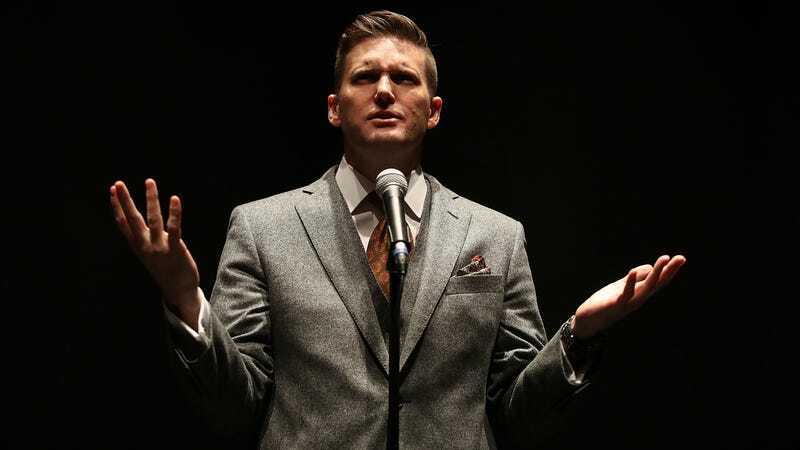 A white supremacist bigot brunch was canceled midway through on Sunday when the owners of a Montgomery County, Md., farm realized that “alt-right” agitator and unverified tweeter Richard Spencer was behind the event. According to the Baltimore Sun, the National Policy Institute, Spencer’s “think tank,” rented Rockland Farms to host about 100 people for a white nationalist get-together. Organizers described the conference as a “corporate gathering,” obscuring the fact that it was a meeting of racists who wanted to recap the events of 2017. When the owners of the venue, popular for its winery, bucolic scenery and not-ethnic-cleansing agenda, discovered that the location would be inundated by white men seething about diversity, equality and their disproportionately small penises, they kicked out all of the attendees and refunded Spencer’s security deposit, which was probably going to bounce anyway. The event included a brunch of unseasoned chicken breasts and celery casserole. Invited speakers included Kevin MacDonald, who is described by the Southern Poverty Law Center as “the neo-Nazi movement’s favorite academic,” and Daniel Friberg, the European editor of AltRight.com, according to the Baltimore Sun. Nazis, Klansmen and white supremacists paid $225 each to attend the conference, which was scheduled to run from 11 a.m. until 8 p.m., but were not told that the event would be held at Rockland Farms. Instead, they met at various locations and were loaded into vans that took them to the farm, located outside Washington, D.C. If communists came to my establishment but they were civilized, I couldn’t imagine kicking them out. So I’m certainly disappointed, but we are not going to retaliate. It’s just life in 2017 for us. Poor white supremacists. It is blatantly un-American to deny a group of people their right to peacefully assemble simply because of prejudice. If there’s one thing white people don’t want, it’s to be judged by the content of their character instead of the color of their skin. It must be so hard. Read more at the Baltimore Sun.